Collection is not something that we strive for only in dressage – that a horse carries more weight on the haunches is in several ways important for all equestrian disciplines. Most importantly, the horse is built in way so that he naturally carries more weight on his front legs and when we ride him we want him to lift his back and shift the weight back to carry himself more on the haunches to not cause damage to the front legs. 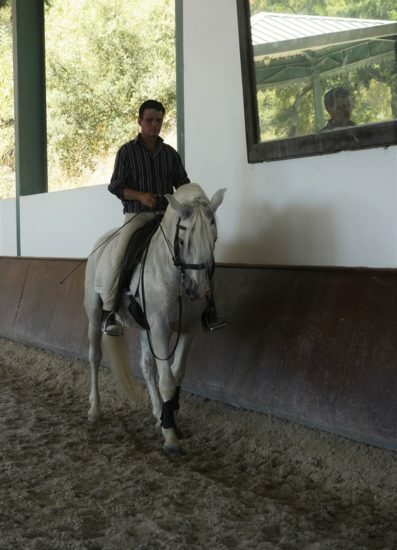 To attain further collection in a horse creates balance and relaxation but at the same time it can also be used to have the horse more sharp and forward depending of what you ask of the horse. In show jumping it’s easy to see how collection can be used for a great forward, as well as lifting force or how collection enables quick and narrow turns required in Working Equitation. 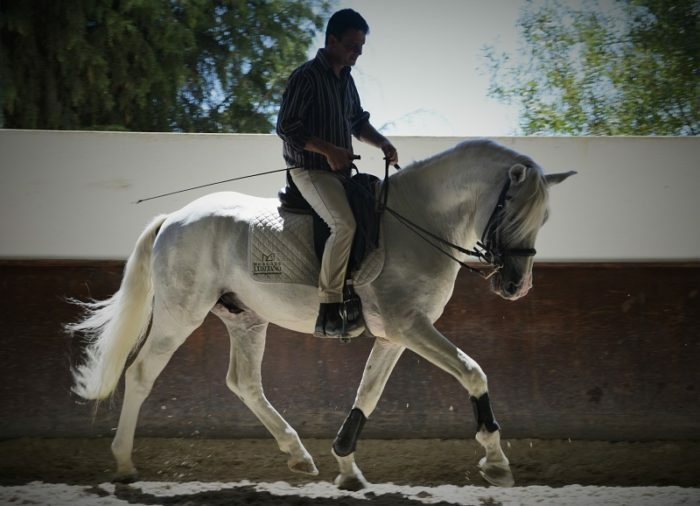 One of the many exercises that can be used for helping the horse to shift his weight back and lower the haunches is the rein-back. The rain-back works suppling and help to engage the back of the horse. As the rein-back requires another system of movement it’s also good for engaging muscles not normally reached and to give a different movement pattern for joint suppleness, actually rein-back works suppling for the whole body of the horse. Rein-back is also great for straightness. Rein-back is often applied the beginning of collected work and used to reach a higher level of collection but it’s a very useful exercise for many different kind of horses and situations. In dressage tests the rein-back is normally between 4-6 steps but for suppling and shifting the weight back towards collection the rein-back can be just one or two steps up to quite long, depending on the horse and what you are trying to achieve. What is important is that the horse doesn’t fall forward and get heavy in your hand but instead rein-back straight remaining with forward energy and equal contact on the reins. In a good well balanced rein-back the horse should lower his haunches, walk straight backwards with remained energy and not drag his legs or get crocked. During collected work it is important to allow the horse to stretch. To test the straightness of the rein-back it’s important to stay away from the walls. There is several ways to correct the rein-back and how to do it is dependent on where in the body horse blocks himself, most often it’s in the shoulder or in the back. When the horse get crocked in the rein-back or resists simply go forward and help the horse find the right position before reining-back again. If the horse drops or block his back or doesn’t rein-back straight it can also be beneficial to put the horse in the position of a shoulder-in. If the horse tends to drag his hind legs in the rein-back or loses energy, just do very few steps then go forward and repeat. To rein-back the horse in a figure eight is a very good exercise as it’s both suppling and demands controlling the full body of the horse. As riding is something very subjective and the rein-back needs to be adapted to the schooling level, abilities and needs of your horse it’s advisable to speak with your riding instructor that is familiar with your horse and your riding if you have any doubts or questions around the rein-back.